Researchers are poised to start clinical trials with a new "smart bomb" treatment, derived from the flower, targeted specifically at tumours. The treatment, called colchicine, was able to slow the growth of and even completely "kill" a range of different cancers, in experiments with mice. The research was highlighted at the British Science Festival in Bradford. 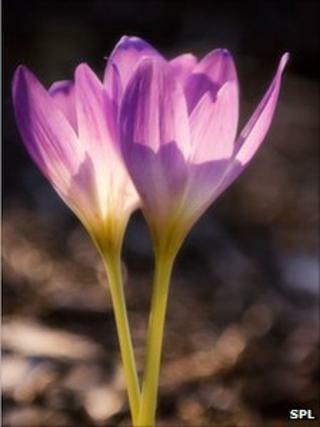 The native British Autumn crocus, otherwise known as "meadow saffron" or "naked lady", is recorded in early herbal guides as a treatment for inflammation. This is because it contains the potent chemical colchicine, which is known to have medicinal properties, including anti-cancer effects. The researchers at ICT have now altered the colchicine molecule so it is inactive in the body until it reaches the tumour. Once there, the chemical becomes active and breaks up the blood vessels supplying the tumour, effectively starving it. This effect is made possible because of enzymes that all tumours produce, whose usual function is to break down the normal cells nearby, allowing the tumour to spread. The modified colchicine molecule has a protein attached to it that makes it harmless. But the tumour enzyme specifically targets the protein and removes it. The colchicine is then activated, and the process of breaking down blood vessels and starving the cancerous cells begins. One of the things that may make this drug so effective, Professor Patterson said, is that it will be "only active in the tumour, and not cause damage to normal tissue". Because the enzyme necessary to activate the toxic colchicine is produced only by solid tumours, it may be possible to treat cancers effectively with virtually no side effects to the rest of the body. Moreover, as the drug will be activated wherever the enzyme is produced, the delivery mechanism should allow treatment of particularly problematic cases of metastasis, where the cancer spreads from its initial site. Pre-clinical tests in mice have shown startlingly successful results. "What we're looking for is a delay in the growth of the tumour," said Professor Patterson. "But sometimes the treatment is so effective that in half of the studies, the mice appeared to be cured of their cancer. All mice responded to the treatment." Just one dose of the colchicine produced this remarkable effect. But if it passes clinical tests, the researchers believe it will be used alongside existing cancer treatments, as part of the complex process of tackling the disease. The researchers hope that the treatment will enter the initial stage of clinical testing at St James's Hospital in Leeds within the next 18 months. Professor Patterson said that he was "very optimistic about the opportunities of the treatment, but still cautious because everything done to date has been in the laboratory". Paul Workman, head of cancer therapeutics at the Institute of Cancer Research, called the work an "interesting new approach". "The project is still at quite an early stage but the results so far look promising in the laboratory models that have been studied," he said. "If confirmed in more extensive laboratory studies, drugs based on this approach could be very useful as part of combination treatments for various cancers."